Familiar ingredients, new flavors, clever details. These are the three words that represent the exquisite fare that you will find at Bisl - the kind of restaurant that thrives on creative cooking techniques and delicious surprises. Bisl’s ever-changing menu is divided into five parts: bites, greens, ramen, plates, and sweets. The chefs at Bisl describe their food as tapas-style dining, inviting guests into a welcoming atmosphere where they can sample multiple savory items pushing the boundaries of your traditional farm-to-table fare. The chefs at Bisl are less concerned about following the rules than they are with providing an exciting, engaging experience. 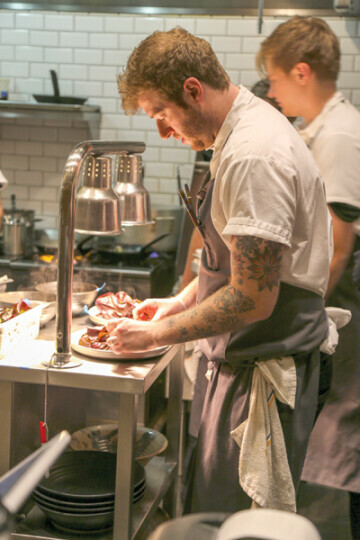 Davey and Kierst Rabinowitz share a passion for fine dining and locally-sourced foods. They met in the kitchen, working in Portland at an Asian restaurant called Departure. They eventually decided to return to Montana and open their own establishment. Two years later they are embarking on a new adventure: a ramen-focused fast food establishment named The Ramen House. A ramen restaurant has long been in the cards for the couple, as ramen emerged as one of the most popular dishes at Bisl, their first culinary endeavor. 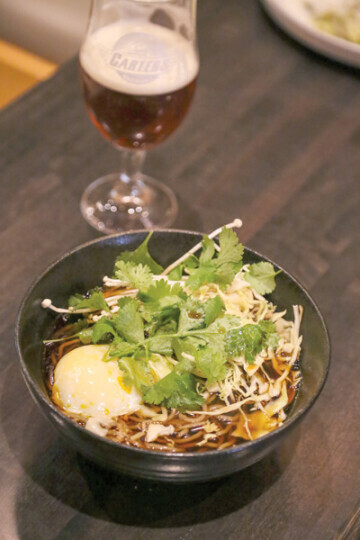 The Ramen House shares Bisl’s emphasis on organic and locally sourced ingredients. Located in the old Rocky Mountain Seafood building just north of the University Square Shopping Center, The Ramen House includes a drive-through as well as indoor seating with counter service. Jessica Lewis: How was Bisl conceptualized? How did this place come about? Davey Rabinowitz: Bisl was created about four or five years ago; we were actually a pop-up series and then catering. When I was cooking over in Copenhagen, I received a phone call from my wife and she told me that there was some property on Main Street that we should look at. I said to wait until I came back because she couldn’t move over there, and we were pregnant with our first child, and I was doing an apprenticeship in Copenhagen. She called me the next day and said “Guess what? We bought it.” So, needless to say, I was like “alright here we go.” It took us about a year to redo the whole space; there’s a labor of love into it. Kierst and I scraped all of the plaster off all the walls and uncovered the brick. We wanted to do something a little more modern. Kierst and I both cooked in Portland, so we asked ourselves: How can we create a restaurant that’s modern but still the ideology of a la carte and food that people can really enjoy, but not over the top small plates? April 7th, 2016 we opened our doors and for the first few months we were super scared because we didn’t know if we were going to make it or not. We had to change and revamp a lot of things but now we are over two years into it and we’re just still doing what we want want to do and enjoying it. JL: Tell me a little about yourself. What made you want to get into the restaurant industry? DR: The restaurant industry was one of those things that I really wanted to be a part of. I started as a dishwasher at Ted’s when I was 18, and all of a sudden I started cooking and I absolutely enjoyed it. I had to ask myself, do I finish college or do something right now that I’m super passionate about? It was easy for me because I wasn’t just doing something that I thought I had to do; it was what I was passionate about. The passion is still there and it’s driven me to where I am now. It’s been difficult, but it’s also been extremely rewarding with the kitchens I’ve worked in. Bisl has been everything and nonstop. JL: Your new adventure is the Ramen House, can you tell me a little bit about it? What led to opening a new restaurant? DR: The Ramen House is something that we’ve always wanted to do. It was the baby from Bisl’s ramen and we had been talking about it for awhile. I always wanted to open up a ramen house and when I got back from Copenhagen, and was in the midst of Bisl, I looked at my wife and said, “should we just do the ramen house?” We always wanted to do Bisl, but the Ramen House was always in the back of our minds. We decided to put ramen on when we first opened and we did this humongous bowl, and we were like “this isn’t ramen.” We changed it and did this actual bowl of ramen and we put a ramen section on the men,seafood, pork and veggie. We realized we needed another place for ramen because people come into Bisl just for ramen, but Bisl isn’t ramen house. It’s the restaurant that we want to not associate ourselves with ramen. After awhile, we figured out what our ramen was going to be. At The Ramen House we’ve got three styles of ramen. The traditional style, but it’s not tradional whatsoever. You take a bowl of ramen and you have to look at it like a pizza. If you bring a Chicago deep dish pizza to Sicily or old school Neapolitan pizza, they’re going to tell you it isn’t pizza. So that’s how it is with our ramen. We get our pork out of Belgrade and it is naturally sweeter than I’ve ever tasted before, so our tankatsu is a little sweeter. We get this beautiful, organic chicken from Northern Californio it’s going to be different than the chicken you get from Japan. Hence our broth is going to be different than what you have in Japan. Our shio, I grew up Jewish, is kind of matzo ball soup meets chicken shio. Our noodles are made everyday and our broth. We had this ideology that we wanted to bring something different to the table. Our noodles are a touch thicker, but that’s what we like. It’s a very simple menu with eight or nine options and three different styles of ramen and one noodle bowl with shrimp. We’re excited about it! JL: What makes Bisl and The Ramen House unique in the Bozeman? What do you offer that other places don’t? DR: I think every restaurant in this town is unique in their own way; we’re just excted because Bisl is more of a modern restaurant then maybe what you would see here. The Ramen House is one of those places that it’s our style of ramen. We source most of our Asian goods from a huge market out of Seattle, which imports from Japan. There’s not one thing we take for granted or take shortcuts with. I don’t like to consider ourselves different from anyone else because I think everyone is doing great things. DR: With Bisl, I want people to have a really good understanding that this is our style of food. I really want people to sit here for two hours and just enjoy the evening. I want people to come in and know that we’re going to take care of you and give you the best attention possible. Whether it’s our natural wine list or our foods that we source, either local or regional and organic, it’s what we want to do. Bisl is very much organic- sustainable, especially with compost systems in the back and fermentation, there’s not a lot of waste or scraps. All of our mushroom stems we dehydrate to make gluten free soy sauce. It’s one of those things that we want people to come and sit and enjoy their evening. DR: It’s the community. I’ve lived here for 10 years, off and on, and there’s not a community like this anywhere. It’s the greatest thing I’ve ever seen in my life and it’s the best thing of all time. So many people are the nicest people and there’s not one thing that I wouldn’t try and give back to this community. DR: Probably the beef tartar or our mushrooms, which we’ve had since day one. Our tartar has transformed to different styles of tartar but the mushrooms have always stayed the same. Bisl is a sophisticated and cozy space, and is sure to be a favorite for date nights. The petite confines – with a capacity of 42 diners – creates a warm and welcoming atmosphere, decorated with softly worn brick walls and a wood-framed ceiling. The ambiance is warm and personal, with a simple, clean décor of subdued lighting and minimal paintings, a low hum of diners over background music, and both the servers and chefs taking the time to answer diners’ questions and explain how dishes are prepared. Their passion and drive is visible every night. Bisl is open Tuesday – Saturday, 5 p.m. to 9 p.m. The Ramen House is open Sunday – Saturday, 11 a.m. to 9 p.m. The ever-growing movement to eat local and support sustainably-harvested ingredients has found a place in Gallatin Valley, and both Bisl and The Ramen House are restaurants where patrons can enjoy the exquisite cuisine sourced from local ingredients and created by local culinary experts.